1. Eligibility: Hey America Q2 Instant Win (the “Promotion”) is open only to legal residents of the fifty (50) United States (including District of Columbia) who are at least eighteen (18) years old at the time of entry. Employees of Creamer Nation, LLC d/b/a CafeNation, ePrize, Inc., and their parent and affiliate companies, as well as the immediate family (spouse, parents, siblings and children) and household members of each such employee are not eligible. The Promotion is subject to all applicable federal, state and local laws and regulations and is void where prohibited. Participation constitutes entrant’s full and unconditional agreement to these Official Rules and Sponsor’s and Administrator’s decisions, which are final and binding in all matters related to the Promotion. Winning a prize is contingent upon fulfilling all requirements set forth herein. The Promotion consists of a sweepstakes (the “Sweepstakes”) and an instant win game (the “Instant Win Game”). 2. Sponsor: Creamer Nation, LLC d/b/a CafeNation, 12002 Airport Way, Broomfield, CO 80021. Administrator: ePrize, Inc., One ePrize Drive, Pleasant Ridge, MI 48069. 3. Timing: The Promotion begins on May 6, 2013 at 12:00 a.m. Eastern Time (“ET”) and ends on July 12, 2013 at 11:59 p.m. ET (the “Promotion Period”). There are ten (10) weekly entry periods (each a “Weekly Entry Period”), starting Monday at 12:00 a.m. ET and ending on Sunday at 11:59 p.m. ET. Administrator’s computer is the official time-keeping device for this Promotion. 4. How to Enter: During the Promotion Period, visit www.whatsyourid.com and select whether to visit the Instant Win Game or the Sweepstakes. Then complete and submit the registration form. If you choose the Sweepstakes path, follow the links and instructions to receive one (1) entry into the Sweepstakes. If you choose the Instant Win Game path, you will receive one (1) Instant Win Game play for that day. Once on the Instant Win Game page, follow the links and instructions to play the Instant Win Game. The Instant Win Game results will be instantly displayed. Potential winners of the Instant Win Game will be provided directions for validation. No matter which path you choose, you will have the opportunity to participate in both paths according to the limit set forth in section 5. All potential winners are subject to verification before any prize will be awarded. Administrator is responsible for the functionality of the Instant Win Game. Limit: Each entrant may enter the Sweepstakes one (1) time during the Promotion Period and play the Instant Win game one (1) time per day during the Promotion Period. Multiple entrants are not permitted to share the same email address. Any attempt by any entrant to obtain more than the stated number of plays/entries by using multiple/different email addresses, identities, registrations and logins, or any other methods will void that entrant’s plays/entries and that entrant may be disqualified. Use of any automated system to participate is prohibited and will result in disqualification. Sponsor is not responsible for lost, late, incomplete, invalid, unintelligible or misdirected registrations, which will be disqualified. In the event of a dispute as to any registration or play, the authorized account holder of the email address used to register will be deemed to be the entrant or player. The “authorized account holder” is the natural person assigned an email address by an Internet access provider, online service provider or other organization responsible for assigning email addresses for the domain associated with the submitted address. Potential winners may be required to show proof of being the authorized account holder. 5. Sweepstakes/Instant Win Game: Administrator is an independent judging organization whose decisions as to the administration and operation of the Promotion and the selection of potential winners are final and binding in all matters related to the Promotion. Sweepstakes: Administrator will randomly select the potential Sweepstakes winner, from all eligible entries on or around the business day following the conclusion of the applicable Weekly Entry Period. Instant Win Game: Three thousand one hundred (3,100) random, computer-generated winning times, one for each prize listed below, will be generated during the Promotion Period. If you are the first player to play the Instant Win Game at or after one of the randomly-generated times, you will be a potential instant winner of the prize indicated. 7. Verification of Potential Winners: Receiving a prize is contingent upon compliance with these Official Rules. The potential Sweepstakes winners will be notified by mail, email or phone. The potential Grand Prize winner (parent/legal guardian if winner is a minor in his/her state of residence) will be required to sign and return a Declaration of Compliance, Liability and Publicity Release which must be received by Administrator, within seven (7) days of the date notice or attempted notice is sent, in order to claim his/her prize. If a potential winner of any prize cannot be contacted, or fails to sign and return the Declaration of Compliance, Liability and Publicity Release or provide any other requested information within the required time period (if applicable), or prize is returned as undeliverable, potential winner forfeits the prize. In the event that a potential winner of a prize valued over $25 is disqualified for any reason, Sponsor will award the applicable prize to an alternate winner by random drawing from among all remaining eligible entries. There will be three (3) alternate drawings after which the prize will remain unawarded. Prizes valued $25 or less will remain unawarded. Non-trip Prizes will be fulfilled approximately 8-10 weeks after the conclusion of the Promotion. Sweepstakes Prize: ONE (1) GRAND PRIZE: A trip for four (4) to Disneyworld. Trip package includes round trip, coach-class air transportation for four (4) from a major airport near winner’s home (determined by Sponsor in its sole discretion) to Orlando, FL; six (6) nights’ accommodations at a hotel determined by Sponsor in its sole discretion (single room, double occupancy); a rental car for length of stay; four (4) 7-day Magic Your Way tickets; $1,000 spending money; and travel agent services. If winner does not meet requirements for rental car, that portion of the prize will be forfeited in its entirety; Winner must complete the trip within one (1) year from the drawing date or prize will be forfeited. Trip must be booked at least twenty-one (21) days prior to departure. Travel and accommodations are subject to availability and blackout dates. Travel must be round trip. Sponsor will determine airline and flight itinerary in its sole discretion. No refund or compensation will be made in the event of the cancellation or delay of any flight. Travel is subject to the terms and conditions set forth in this Sweepstakes, and those set forth by the Sponsor’s airline carrier of choice as detailed in the passenger ticket contract. All expenses and incidental travel costs not expressly stated in the package description above, including but not limited to, ground transportation, meals, incidentals, gratuities, passenger tariffs or duties, airline fees, surcharges, airport fees, service charges or facility charges, personal charges at lodging, security fees, taxes or other expenses are the responsibility solely of winner. Unless child of winner, travel companion must be eighteen (18) years of age or older as of the date of departure or a sibling/friend of winner with the appropriate parental permissions and releases and must travel on same itinerary and at the same time as the winner. If winner is a minor in his/her state of residence, travel companion must be winner’s parent/legal guardian. Travel companion must execute liability/publicity releases prior to issuance of travel documents. Travel restrictions, conditions and limitations may apply. If in the judgment of Sponsor air travel is not required due to winner’s proximity to prize location, ground transportation will be substituted for round trip air travel at Sponsor’s sole discretion. Sponsor will not replace any lost, mutilated, or stolen tickets, travel vouchers or certificates. Approximate Retail Value (“ARV”): $8,925. Actual value may vary based on airfare fluctuations and distance between departure and destination. Winner will not receive difference between actual and approximate retail value. TEN (10) FIRST PRIZES (ONE (1) PER WEEKLY ENTRY PERIOD): A $500gift card (type of gift card to be determined by Sponsor in its sole discretion). Terms and conditions apply. ARV: $500 each. FIFTY (50) SECOND PRIZES (FIVE (5) PER WEEKLY ENTRY PERIOD): A Baking kit, includes: Kitchen-Aid Mixer, International Delight® Iced Coffee Apron, and five (5) International Delight® coffee creamer free product coupons (excludes Iced Coffee products, ARV of each coupon is $3.79). ARV: $365 each. 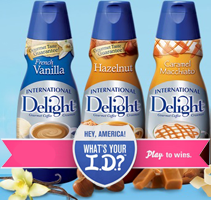 FIFTY (50) THIRD PRIZES (FIVE (5) PER WEEKLY ENTRY PERIOD): International Delight® coffee creamer for a year. Fulfilled as fifty-two (52) free coupons (ARV of each coupon is $3.79), each redeemable for one (1) International Delight® coffee creamer product. ARV: $200 each. ONE HUNDRED (100) FOURTH PRIZES (TEN (10) PER WEEKLY ENTRY PERIOD): A coffee bar kit, includes: Kuerig Coffee Maker with K-cups, Cinnabon Cinnamon, an International Delight® coffee mug, and five (5) International Delight® coffee creamer free product coupons (ARV of each coupon is $3.79). ARV: $215 each. Total ARV of all sweepstakes prizing is $63,675. Limit: One (1) Sweepstakes prize per person. Odds of winning the Sweepstakes Prize depend on the number of eligible entries received during the Promotion Period.